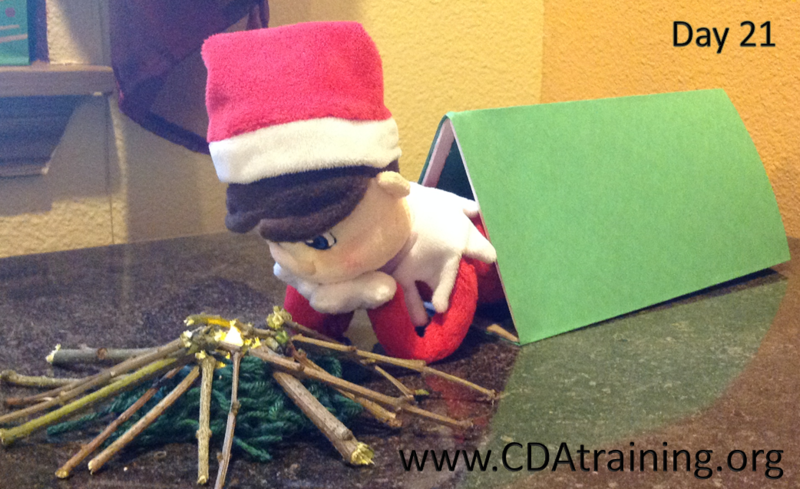 Today our Elf went fishing. We fashioned a fishing pole from some yarn and a candy cane. We then attached a goldfish cracker to the end of the "fishing line" using a drop of glue. As a final touch we tossed a hand full of goldfish crackers into the toilet. 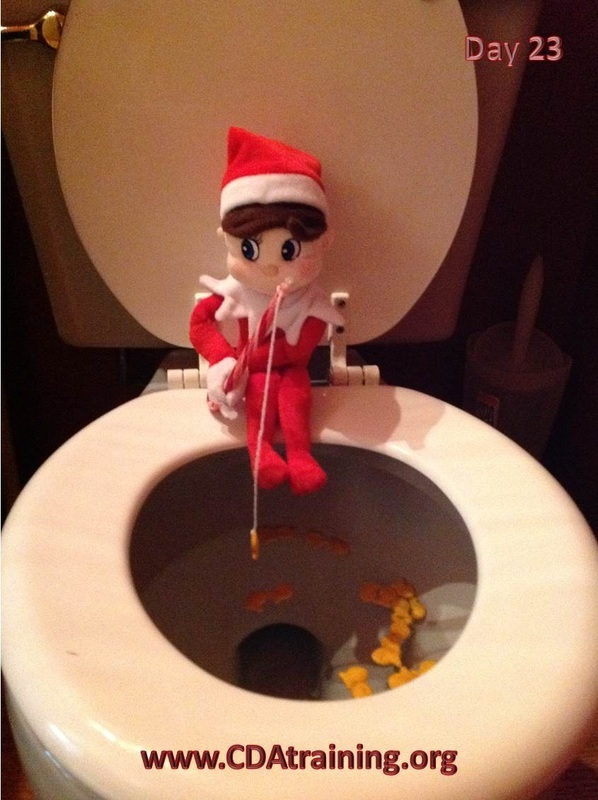 **Be sure to thoroughly clean the toilet before placing your Elf on it. We also wedged him between the seat back and bottom, so that he would not fall into the toilet. 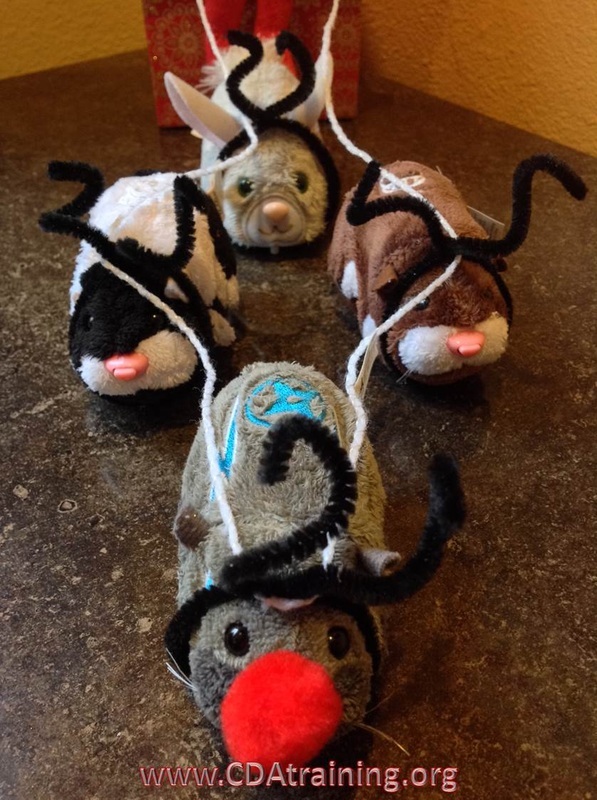 Day 22 - Elf and the "Reindeer"
Today we found our Elf truing to mush a group of Zhu Zhu pets disguised as Reindeer. For this one we used pipe cleaners to make antlers and rolled a small piece of tape to affix a red pompom nose on our Rudolph. We then made a long loop of yarn and threaded it around our "reindeer" to make it look like a lead. This morning we woke up to find our Elf camping in our computer room. 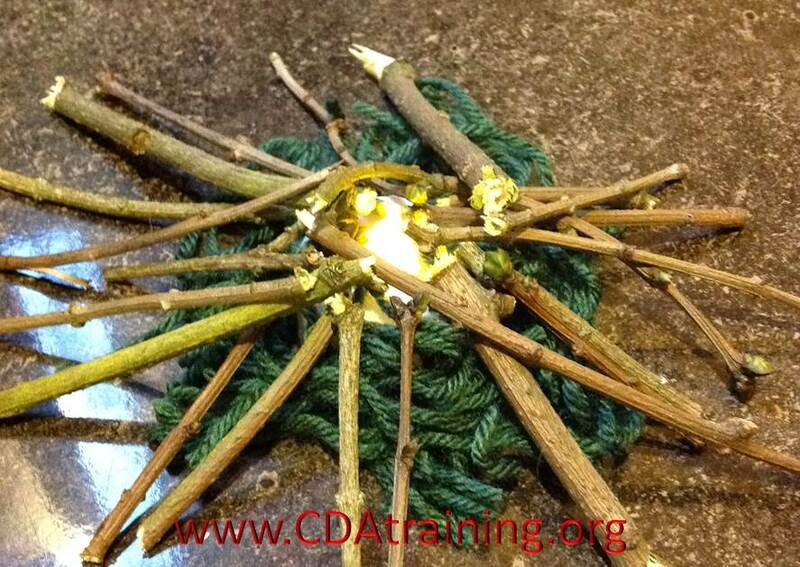 We made the camp fire using an electric tea light, green yarn, and some twigs. 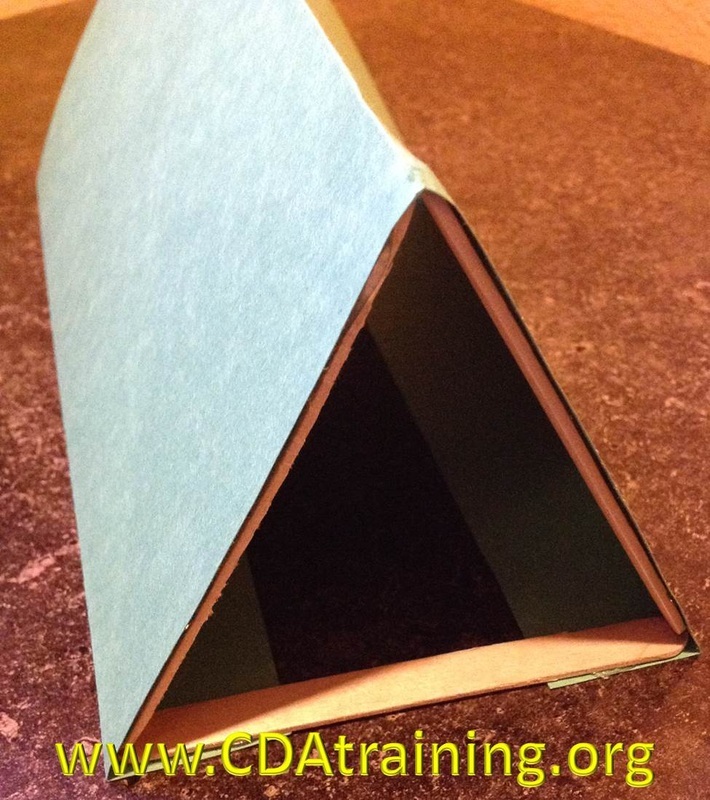 The tent was fashioned using a piece of green construction paper, and three popsicle sticks. You can use the images below to see how the camp fire and tent are made. 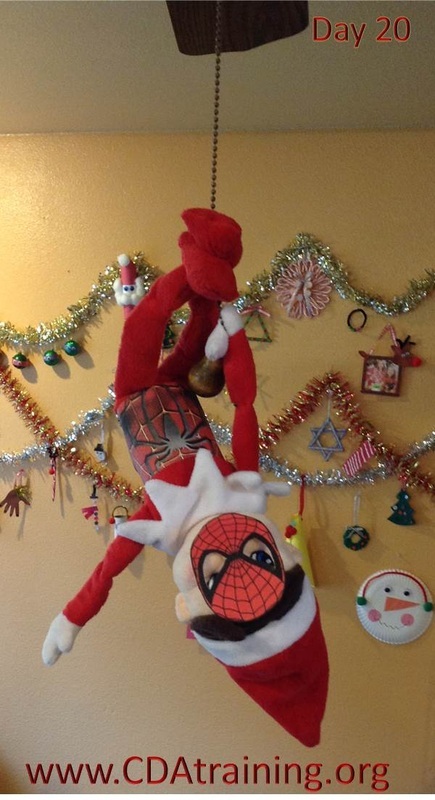 Today we found our Elf disguised as Spiderman and swinging from one of the ceiling fan pull-strings. For this one you can print out the mask, and the body armor. We affixed the mask and body armor with pieces of rolled tape. 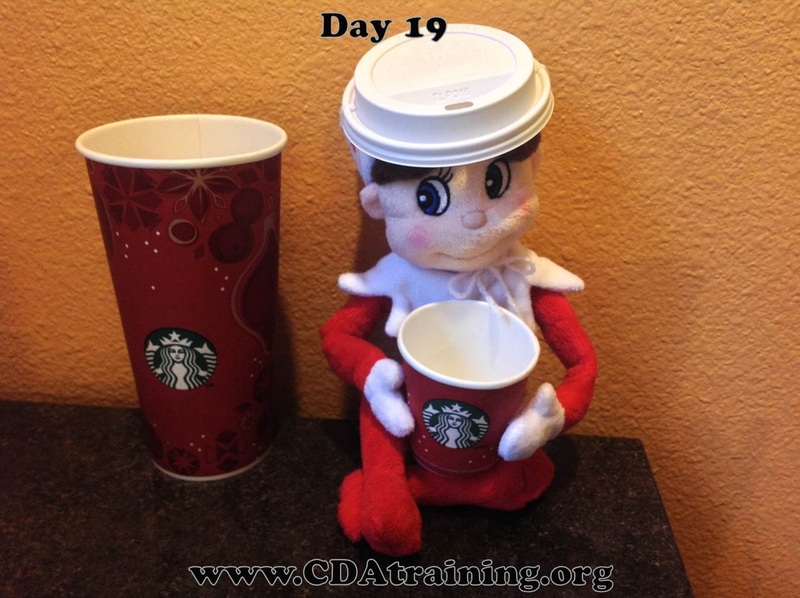 Today we found our Elf pretending to be a coffee cup. 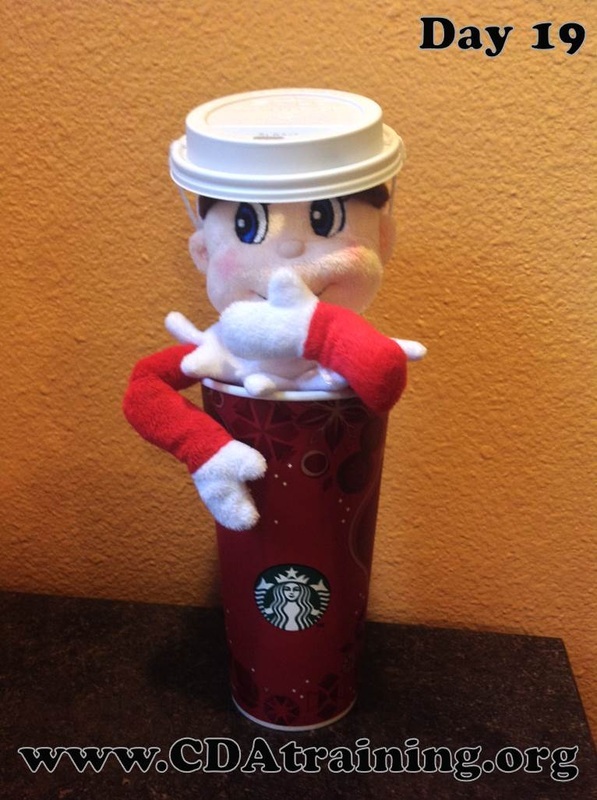 For this one we used a "venti" cup and lid. 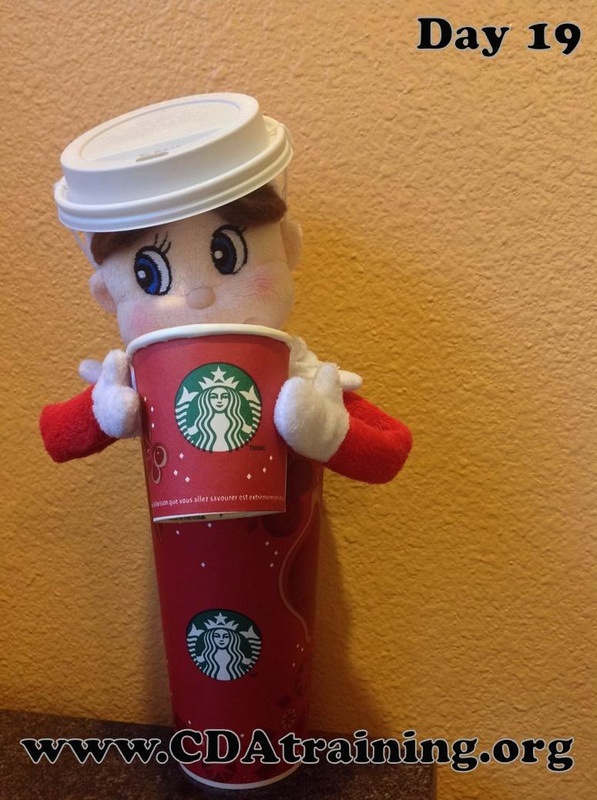 To affix the lid to our Elf's head, we poked two holes in the side of the lid and threaded some yarn through each hole, then tied the thread at the Elf's chin (creating a bonnet). We then stuffed him into the cup. Some other fun ideas are posted below, using a "sample" cup. 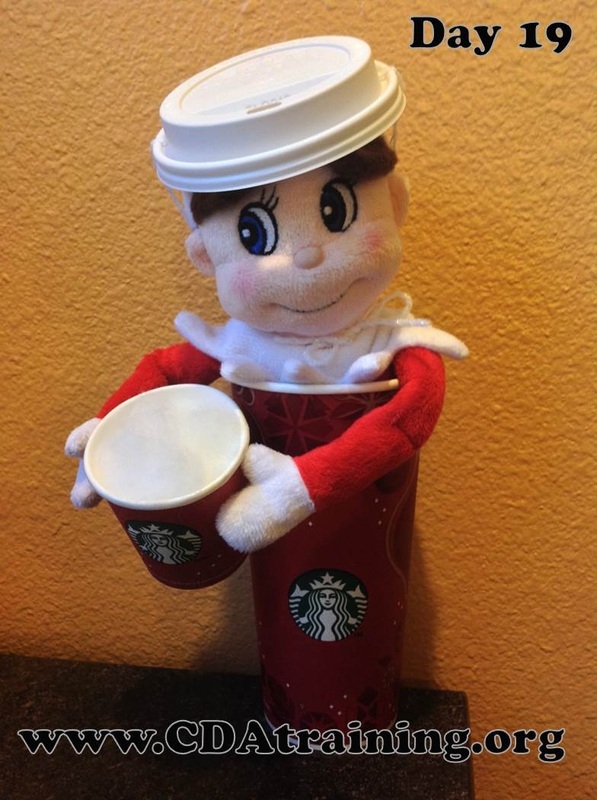 We had the Elf hold the "sample" cup by attaching it with a piece of rolled tape. 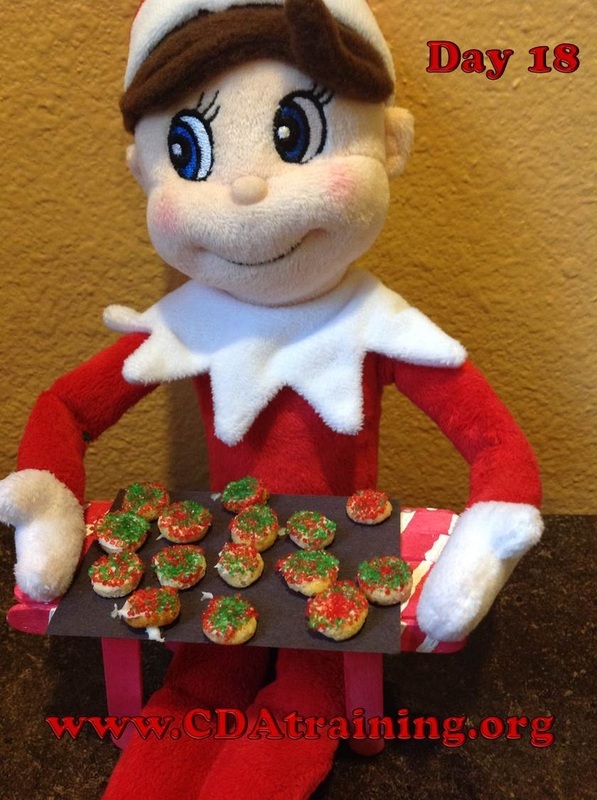 Today we incorporated our Elf Table from yesterday's post to hold our Elf Doughnuts. We made the doughnuts by covering cheerios with frosting, and then dipping them in sprinkles. 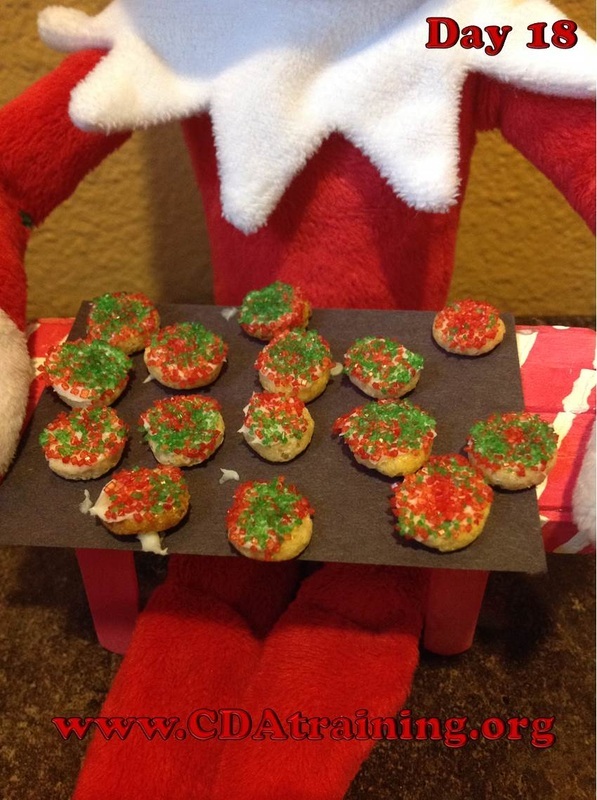 They were actually pretty good, and were a small sweet snack for the kids when they discovered them. 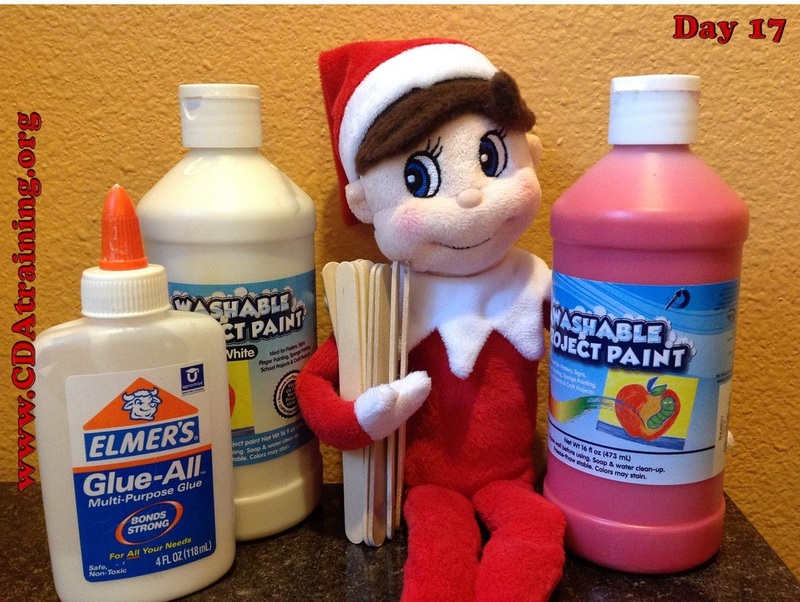 Today our Elf has another craft for us to make. 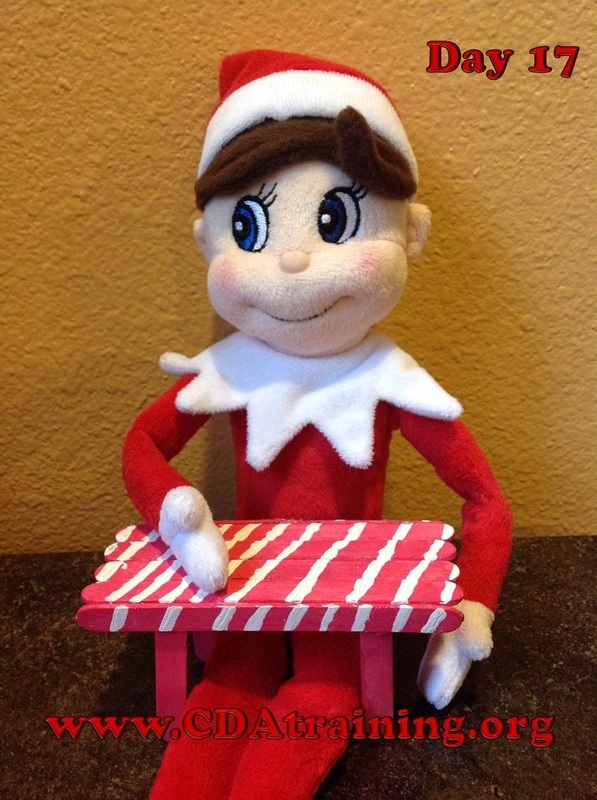 We went to the Official Elf on the Shelf Website and found directions to make an Elf Table. 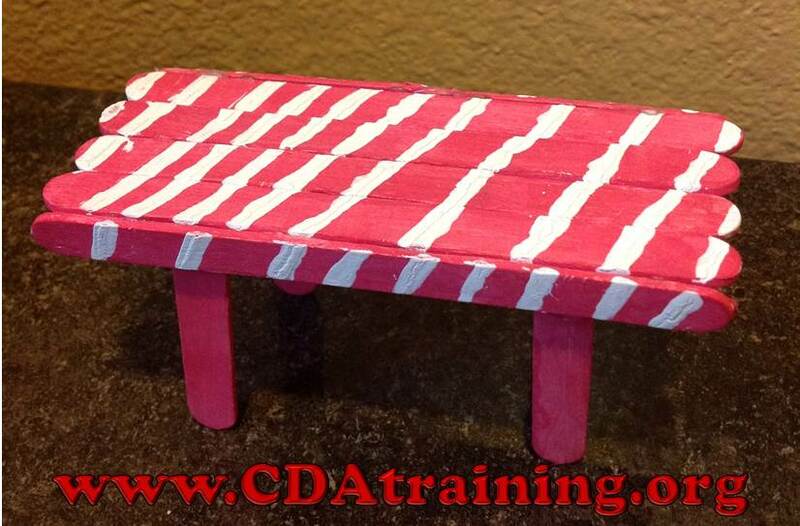 It took a while to finish, but in the end we were proud to have a table our little Elf could use. Here's a super easy and fun one. 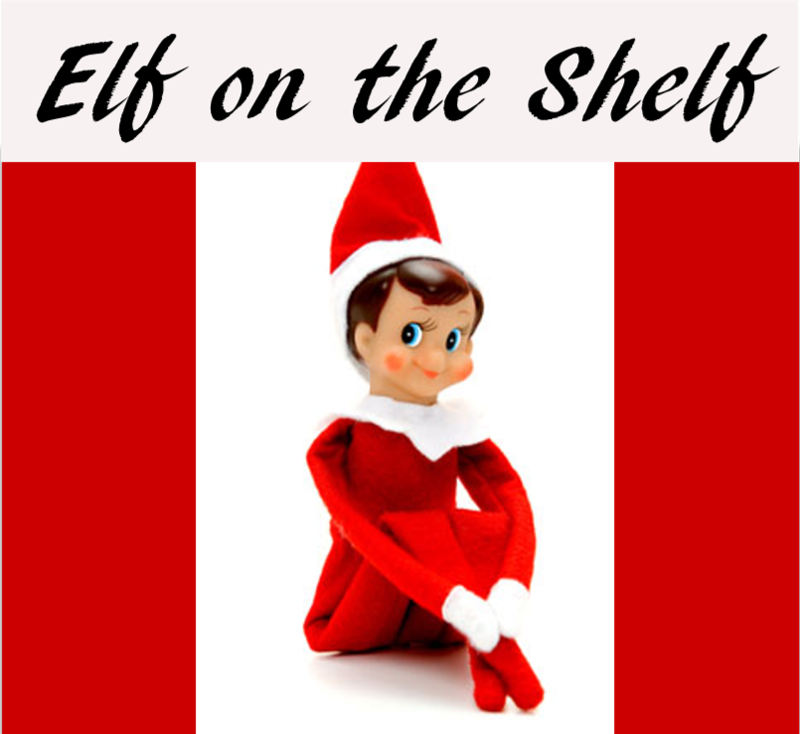 Just print out the template below, cut out the square where indicated, fold the paper at the edge of the pattern to create a tri-fold and place your Elf behind it.